Description | Richardson Electronics is a worldwide distributor of laser filters for machines from all major manufacturers. Because these CO2 laser consumables are directly related to the health and safety of your technicians and staff, it is important that they be replaced as needed to ensure maximum efficiency. 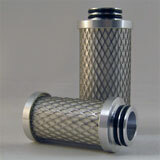 We supply both OEM replacement laser filters and cost-effective aftermarket alternatives. Our dust collector laser filters come from European and American manufacturers, and are made from the highest quality components. We have replacement laser filters rated at MEV 15 or higher, to capture even the finest particles produced by your laser machine. Richardson Electronics' laser filters are precision manufactured to match the exact specifications of your system. We have replacement filters for nearly any make and model, and perfect fit and compatibility are guaranteed. In addition to dust collector laser filters, we also supply water filters to keep the cooling system in your laser machine clean and free of contaminants. Even the smallest impurities can quickly lead to corrosion and breakdown in your laser's cooling system. Richardson Electronics' water system filters will help keep your machine operating at its peak.